Information Systems Development has been adopted as the key text for many information systems, business and management, and computer science courses. 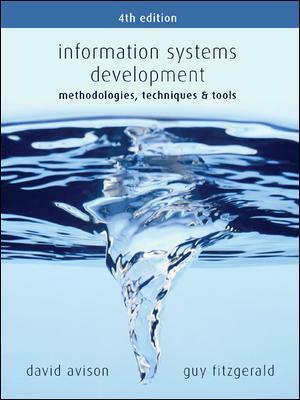 The book has seven parts which relate to the Information Systems Development Context, the Systems Development Lifecycle, Themes of Systems Development, Techniques, Methodologies, Tools and Toolsets and finally Issues and Frameworks. This structure enables flexible use, either sequentially or by selecting sections or chapters to fit the specific needs of particular courses and favoured approaches. Offering comprehensive coverage from traditional approaches through to the most recent agile methods, the book's unique strength lies in its combination of descriptions and insight into methodologies, techniques and tools with the analysis of context, issues and real-world problems associated with information systems development. Retaining these existing strengths, the fourth edition has been thoroughly updated and revised to reflect progress in this fast-paced discipline and to include the authors' recent experience of teaching with the text, as well as feedback from reviewers, colleagues and students. David Avison is Distinguished Professor of Information Systems in the Department of Information Systems and Decision Sciences (SID) at ESSEC Business School, Paris, France. He has published and edited over twenty leading texts on Information Systems. Guy Fitzgerald is Professor of Information Systems at the School of Information Systems and Computing at Brunel University, UK. He has published widely in the areas of systems development, flexibility, outsourcing and strategy.